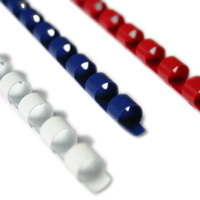 This is the most popular method of binding, these plastic binding combs are a piece of plastic with flexible "teeth" with either 20 or 21 rings that fit into rectangular holes punched into the paper. These are often called binding coils which sometimes are mistaken for spirals or wire binding coils. The documents can lay flat when opened. 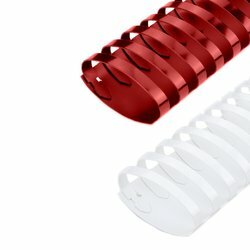 Plastic comb binding is an inexpensive but professional looking option. Consider purchasing binding covers which are available on our site.